Occidental College President Johnathan Veitch speaks with students during a demonstration on Thursday. Occidental College and Amherst College are thousands of miles apart. Yet they are the two latest schools where students are voicing their opinions on the racial climate on campus. 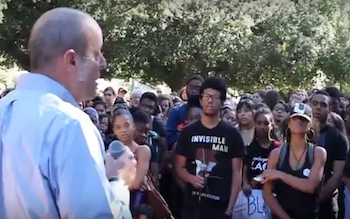 Oxy United for Black Liberation Group, a student organization at Occidental College in Los Angeles, is demanding the resignation of President Johnathan Veitch. Hundreds of students began staging a sit-in of a campus administration building on the Eagle Rock campus Monday and continued the protest into Tuesday. Activists say Veitch has not remedied an atmosphere of racial insensitivity fueled by a lack of diversity on campus. Oxy United gave the administration a list of 14 demands on Thursday, which includes the “immediate” resignation of Veitch, more diversity training for students and faculty, immediate removal of the Los Angeles Police Department on campus, the creation of a fully-funded Black studies program and an increase in funding for minority student groups. Related Story: Black Lives Matter Student Protests Around the U.S. The demands are currently under review by the administration. “We definitely welcome the opportunity to engage those in a meaningful and thoughtful way,” Marty Sharkey, the school’s associate vice president of marketing and communications, told the Los Angeles Times. Last week, students showed solidarity with University of Missouri, where student protests led to the resignation of Timothy Wolfe. Mary Spellman, who served as a dean of Claremont McKenna College in Los Angeles, also resigned from her position following protests. Some incidents of racism at Occidental include a student being called the N-word on campus and, last year, a fraternity party with an End of the World-Malaysian Air-ISIS-Ebola theme. During a demonstration on Thursday, Veitch responded to Oxy United’s list of demands. Veitch received criticism from students and faculty for leaving the demonstration after students questioned the administration’s handling of allegations of sexual assault.Students want their demands to be met by Friday. To the community, I ask that you help me find a way to restart and maintain a conversation about diversity and inclusion that will be transformative. Over the next 24 hours, I am personally reaching out to leaders of this movement and inviting them to join me in this important work. Last year, he received a contract extension from school trustees, which runs through 2020. Sharkey said the school administration is not going to force students to leave the administration building. The college has approximately 2,100 undergraduate students, of which 52 percent are white, 16 percent Latino, 13 percent Asian, 4 percent Black and less than 1 percent Native American. “This institution ignores how uncomfortablewe feel on a day-to-day basis,” organizer Diamond Webb said. A student sit-in at Amherst College’s Robert Frost Library took place from Thursday until Sunday. The protest, coined by students as the “Amherst Uprising,” was an opportunity for students to air their grievances as well as share experiences of racism on campus. “Seeing the crying, the insecurity, people so seriously isolated that they were at the point of breaking down in front of their peers and being forced to take leaves for multiple semesters was really impactful,” said Mostafavi, a graduate student pursuing environmental conservation at UMass. Students compiled a list of 11 demands for President Biddy Martin. Demands include several statements of apology from Martin and Chairman of the Board of Trustees Cullen Murphy to students, alumni and faculty regarding injustices on campus and institutional legacy of white supremacy as well as a statement condemning the “inherent racist nature” of the school’s unofficial mascot, “Lord Jeff,” and the removal of its image from all memorabilia. Both the college and the town of Amherst are named after Lord Jeffery Amherst. The 18th century governor-general is said to have given Native Americans smallpox by means of infected blankets to wipe out the population. According to the New York Times, Don Faulstick, the athletic director at the college, told more than 100 students assembled in a hall on campus on Tuesday the college athletic teams have been removing the mascot from athletic gear since September. “I said to my staff, ‘We’re moving on here; the Lord Jeff is done,'” Faulstick said. The student body of the top-ranked liberal arts college in Massachusetts is 42 percent white, 13 percent Latino, 13 percent Asian, 12 percent Black and less than 1 percent Native American. The depth and intensity of their pain and exhaustion are evident. That pain is real. Their expressions of loneliness and sense of invisibility are heartrending. No attempt to minimize or trivialize those feelings will be convincing to those of us who have listened. Our students’ activism is part of a national movement of students who are devoted to bringing about much-needed change.They are exercising a fundamental American right to freedom of speech and protest.Student protesters at Amherst have been threatened on social media with physical violence.The College police are, as always, doing their job of keeping the campus safe.And the administration will ensure that no students, faculty, or staff members are subject to retaliation for taking advantage of their right to protest.